Summer is about fresh veggie and herbs. I can’t think of a better way to use tomatoes, zucchini and basil than in a Summer Caprese Zoodle Bowls. This is a take on the simple mozzarella, tomato and basil Italian salad using ribboned zucchini as “noodles,” a mixture of creamy ricotta and fresh mozzarella, and succulent tomatoes. This would be so amazing with some crusty bread dipped in EVOO. It’s a deliciously different version of your classic caprese dish. Oh my goodness, can I eat this again? Is it tomorrow yet? I’ve been meaning to pick up some red curry paste since I usually have it on hand, but I’ve honestly been out since maybe the fall? Oops. I was thinking I’d make my crispy coconut tofu bowls for this week, but alas, I was at Trader Joe’s on Monday and their red curry sauce — trying something new! — just called my name. Add the zucchini I intended for the coconut tofu, toss in peppers I had, some brown rice noodles I have from my pantry . . . the rest is history. I folded in a generous, generous amount of cilantro and that paired with lime juice made this dish pop! Thai Red Curry Cilantro Noodles will be your new go-to pasta dish when you want a healthy version on takeout in the comfort of your own home. Happy Memorial Day! This may be my new favorite “pasta salad-esque” recipe: Soba Noodles with Carrots, Asparagus & Shrimp. The colors are vibrant, the veggies are different, and I love the amount of fresh basil in this. Serve hot, warm or cold, any temperature will do to enjoy these soba noodles. Soba noodles are made from buckwheat flour (check packaging to ensure they’re gluten-free) and higher in fiber and protein compared to your standard pasta. Paired with edamame and shrimp, the protein and fiber will fill you up and satisfy your pasta cravings. I’m on a kelp noodle kick. This time I switched it up and made a version with shrimp and edamame in a peanut sauce. Yummmm. Even though it’s pretty low-carb, these bowls are packed with protein to keep you feeling full. (If you’re like omg that’s it? Split between 2 servings instead of 3 or add another pack of noodles.) I really like how these noodles have a distinct crunch and adopt whatever flavor profile you’re using. They’re perfect for a Thai-inspired dish, so have at it and dig in to Peanut Shrimp Kelp Noodle Bowls. This dish was bright. I’m not sure how else to describe accurately describe it, but I think bright has just the right connotation: vibrant, citrusy and light. 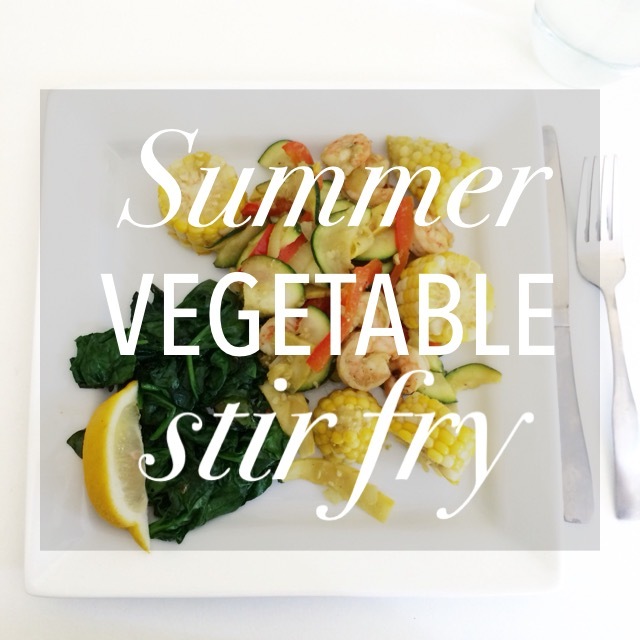 With summer (quickly) coming to an end and late summer vegetables in abundance, I give you Summer Stir Fry. I was inspired to slice the ears of corn into medallions after seeing Martha do it. (Ms. Stewart and I are obviously on a first name basis.) Shrimp always seems to be a lighter option than chicken or steak and it’s a fun way to incorporate seafood. The summer veggies and shrimp were tossed with a lovely Garlic Scape Pesto in Curry from the Ithaca Farmer’s Market. Plate with baby spinach (and maybe some crusty bread and white wine) and bon appétit! So I’m pretty sure this meal came together in under 20 min. last night. Forget the salad for a second. 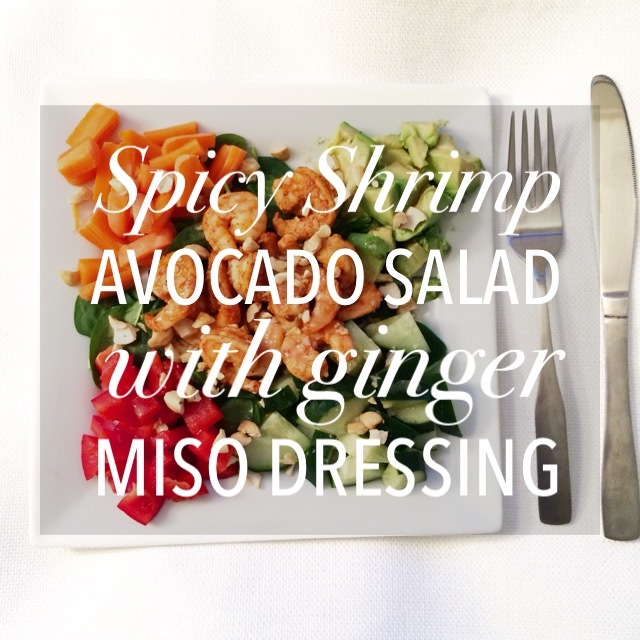 How have I never made this Ginger Miso Dressing?! It’s life changing. I can’t believe I’ve never bought miso until now. The flavor profile is amazing. I see some miso soup in my future…But back to the salad. It’s fresh, light, has a crunch, but’s still creamy and most important is packed with flavor. (You totally thought I was going to say nutrients, right? That too). Substitute chicken for shrimp or exclude the shrimp for a vegan dish. I’m addicted. Thank goodness I found a Pinch of Yum‘s version on Pinterest. This Spicy Shrimp Avocado Salad with Ginger Miso Dressing was totally a winner if I do say so myself. Let’s bring these bad boys back to basics. All the recipes I found for Bang Bang Shrimp or Bang Bang Cauliflower called for panko, breadcrumbs, mayo, honey, eggs, sugar, milk . . . I mean, man, those recipes were still delicious. Breaded, crisply fried and just packed with a kick. I needed a better, lighter option. I obtained a recipe for Bang Bang Shrimp using only four ingredients for the sauce via Pinterest. With some tweaking and using this as inspiration, I cut the original recipes’ fluff and kept all the flavor. 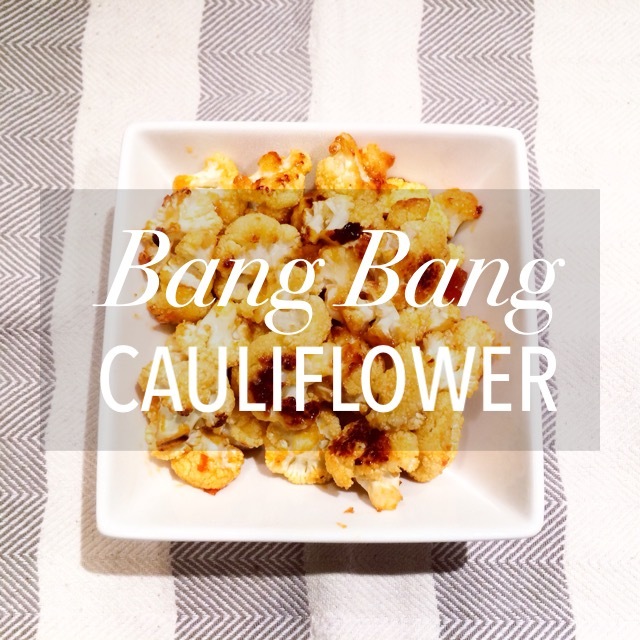 (Double points if you add even more spice to your life and prep these Bang Bang Cauliflower, while listening to “Bang Bang.”) A great option for anyone allergic to seafood, has gluten-free or vegan needs or just willing to try something different. Plus, these super spicy morsels are baked, not fried, and still get crispy and perfectly browned in the oven. Sounds like an all around winning dish to me. Need a light, fresh and tasty dinner? I found this recipe for a grilled summer salad in Giada De Laurentiis’s cookbook, originally served cold. I wish my apartment had access to a grill, but this was still delicious baking the shrimp and sautéing the vegetables until they were slightly browned. Using the marinade to double as the salad dressing saves time, while maintaining the flavor of the fresh herbs and lemon zest. 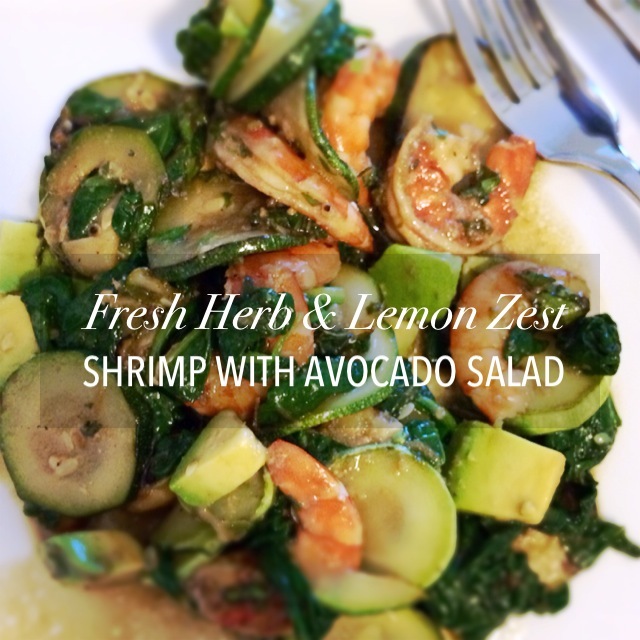 The creamy avocado balances the acidic flavors of the marinade. Definitely worth a try!